Husqvarna, a Swedish manufacturer, well known for their quality and reliability has a long history in the production of all sorts of outdoor power tools. They have come up with some of the best land mowers in the market and it’s almost impossible to not include them in the list of best zero turn lawn mower. With the Husqvarna MZ61 27 HP model they have integrated some of the latest technology to make your land mowing experience a relaxing one. The Husqvarna MZ61 boasts of a 27 HP Briggs and Stratton Endurance V-Twin engine. With this power at your disposal you can tackle even the thickest of lawns with ease and expertise. It has a commercial-rated Hydrogear ZT3100 hydrostatic transmission which is smooth and powerful enough to let you attach large accessories like spreaders, carts, and aerators along with 4 anti scalp rollers. The cutting deck is equipped with a generous 61-inch cutting width, a pedal assisted cutting deck lift, adjustable cutting height from 1.5” to 4.5” and a 3 blade cutting system. The air filtration, the plated valves, the heavy-duty steel frame, the sturdy fabricated steel deck, and aluminum spindles are of premium quality and represent all that this company stands for, sturdiness and durability. These together are also responsible for a faster and easier operation. The robust machine has a top speed of 8.5MPH. So you can now mow up to 4.2 acres of land in less than an hour. The MZ61 zero turn mower is not only known for its top of the notch parts but for its comfort and ease of use as well. It has a high seat with arm rest for comfortable driving, ergonomically designed adjustable steering levers and control panel within the reach of the operator, a spring assisted lift system and foam coated lap bars. A 5 gallon fuel tank ensures that you never run out of gas in the midst of a job. A removable foot pan so that you can access even the top of the cutting deck easily, an anti-slip foot area, an automatic park brake system, a bumper which has led headlights integrated and a rear engine guard are some of the additional features that this best zero turn mower has to its credit. The only areas of concern with this otherwise perfect ZTM is the after sales service of Husqvarna which is a little sloth at times and the fact that it doesn’t have break paddles. So you need to be extra careful while doing downhill or while taking a turn in your lawn. You may leave a few marks if you are not cautious enough. The Husqvarna MZ61 mower comes with 3 year residential warranty and 1 year commercial warranty. Poulan Pro has also been a renowned brand known for its high performance, quality and durability since 1946 and the P46ZX is one of its most talked about model. The brand Poulan is owned by Husqvarna and hence most of their models have a few technologies in common. The Poulan Pro P46ZX is powered by an impressive 22HP Briggs and Stratton V-Twin Pro engine with two cutting blades and a rugged steel frame. You can mow up to 2.4acres of lawn in an hour with this machine. It features a dual Hydro gear EZT drive system. The dual wheel hydro transmission allows you to maneuver each wheel independently and helps to reduce your mowing time to a great extent and enables you to mow around your obstacles with ease and precision. 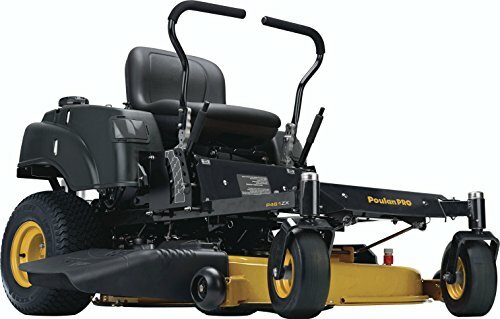 The sturdy 46”twin blade reinforced steel deck is not as wide as the Husqvarna model but is a good enough one if you have an average sized lawn to mow. The blades are controlled by the Electric Clutch Blade Engagement which makes it easy to engage them. The cutting height can be adjusted from 1.5” to 4” in 1/2” increments with the help of an access panel and 3 anti scalp rollers ensure that the lawn is not damaged. It also has a digital hour meter that keeps a track of the time. The castor wheels are sturdy and of exceptional quality and while the rear wheels measure 18” in diameter the front wheels are of 11” This ratio provides great control when you are working up an inclined steep. Poulan Pro zero turn mower has added a 15” extra high back rest for the comfort of the operator, some easy to operate dual levers with hand grips that are padded with foam and a cup holder. The control panel is easily accessible. The Poulan Pro P46ZX has a top speed of 6MPH and a 3.5 gallon fuel tank. The best zero turn mower is covered by a three year limited warranty while the reinforced deck comes with a 10 year warranty on it. Ariens too has a long history of manufacturing outdoor tools dating back to 1933. The company comes a long way starting off with making rototillers and in 2003 introduced a wide range of hydrostatic- drive zero turn mowers and riders. With the Zoom Series it introduced its most agile yet efficient zero turn mowers. The Zoom is available in 42” and 34” deck sizes. For our convenience we would be discussing about the 42” Zoom model. 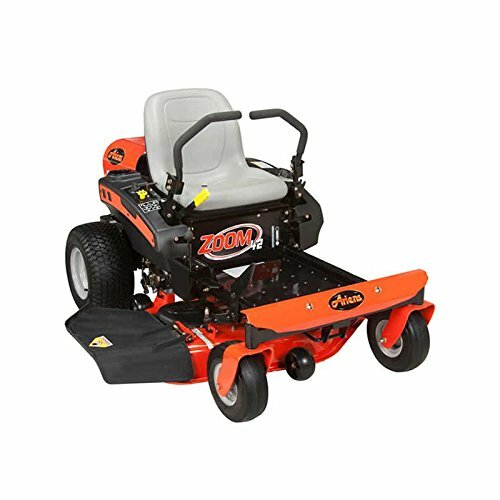 The Zoom 42 is a lot smaller and less powerful than the Swisher model discussed above but can be an ideal choice if you are in the look out for a ZTM that is ideal for small and medium sized lawns. The Ariens Zoom 42 is powered by a 19HP Kohler 6000 Twin cylinder engine which is powerful enough considering the size of the machine to provide a smooth and efficient job. It also features win EZT hydrostatic transaxles which are designed to deliver responsive and effortless control. The cutting deck has a width of 42” and is made of a 12 gauge stamped steel. It has 3 maintenance free spindles designed to give you maximum airflow and an exceptional cutting performance. The deck height can be easily adjusted between 1.5” and 4.5” with the help of a foot assisted deck lift. There is also a handy seat side deck height lever to intuitively adjust the deck height. It has a built in deck wash-out port. You can easily connect a hose pipe to the port and clean the underside of the deck and blades. The ZOOM 42 offers a 18” high back rest comfortable seat with ergonomically designed and easy to reach handles for long mowing sessions. The machine can be operated at a forward speed of 6MPH and a reverse speed of 3MPH and has a 2 gallon fuel tank. There is 3 year limited warranty on the machine and a 5 year limited warranty on the deck and frame. Troy-Bilt is a family owned company based in Valley city, Ohio, USA manufacturing lawn care and gardening power tools for mowing, clean up, snow throwing and cultivating for over 75 years. It combines the simplicity of a traditional riding mower with the effectiveness of a zero turn mower. The simple and unique design of the steering wheel with Synchro-Steer Technology four wheels steering system allows you to maintain control in less ideal mowing environments like hills or uneven terrains. This best zero turn mower is powered by a 22HP 725cc Kohler Twin Courage Engine and features an extra large 54” triple blade side discharge deck for easy and fast mowing of even a large lawn with precision. It also features 8 adjustable deck height settings to adjust the cutting height, a premium integrated deck wash for cleaning, a reinforced heavy duty steel frame for long life and a dual EZT transmission with superior PTO (power take off) technology that enables fast and easy blade engagement. The castor wheels are sturdy and durable. While the greasable front wheels are 11” in diameter the rear wheels are 18”. The greasable front wheels along with the zero turn mower technology and the Sychro-Steer technology is responsible for its high maneuverability. The Troy-Bilt 25HP 725cc Twin Cylinder 54-inch pivot has a maximum forward speed of 7MPH and a reverse speed of 2.5MPH so that your job is done in the best time possible. The machine is equipped with a 18” comfortable High back UV seat and adjustable screw knob and cruise control to provide maximum amount of comfort to the operator. This ZERO TURN MOWER from Troy-Bilt is backed by a 3-year limited warranty and a lifetime limited warranty on the frame and has a fuel tank size of 2.8 gallon. Once again a company that has over six decades of experience in high quality outdoor tools manufacturing has come up with an extremely useful and technologically advanced zero turn mower. The sleek and compact machine incorporates all that you may want in your zero turn mower at a fairly affordable price. The Swisher ZTR2766BS is powered by a powerful 27HP Briggs and Stratton V-Twin Engine with plenty of torque and output. 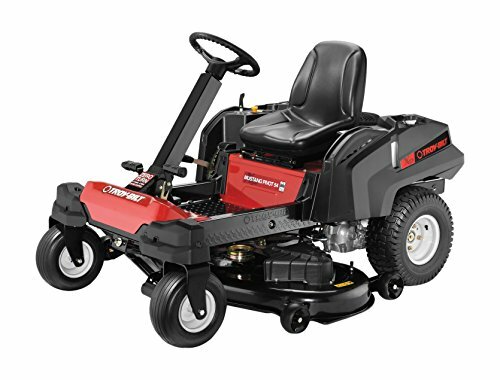 The dependability of the Briggs and Stratton Engine is coupled with Hydro Gear 2800 transmissions, a industry leading Ogura Clutch and a massive 66” cutting deck. These together will definitely give you the fastest and the best cutting experience. Ideally a 4.8 acres land can be easily mowed in an hour with 80% efficiency depending on the terrain. The 66” fabricated deck is made of sturdy 11 gauge steel and has three Gator blades to do the job efficiently. The cutting height can be adjusted between 1.5” and 4.5” with the foot assisted deck lift. The foot assisted deck lift is a little difficult to reach from the operator’s seat which is one of the drawbacks of this model. The mower is capable of moving at a speed of 8MPH both forward and backward which is very impressive. This along with the 360 degree movement adds on to its efficiency. In addition to all these, the Swisher ZTR2766BS boasts of composite fenders, a digital hour meter, a cup holder, ROPS standard, a massive 8 gallon fuel tank and a front and rear hitch. This giant machine feels like nothing when you are sitting atop due to its easy to reach and extremely responsive controls. The Swisher excels at providing maximum comfort and control to the operator. It has a 18” high back seat with arm rests and a seat belt with 6” adjustment range. You can even change the seat height like that of your car. But all these exceptional qualities when packed in a single compact machine makes it a little expensive over the rest of the models in this list. The Briggs and Stratton engine comes with a two year limited warranty. Type of Zero Turn Mower? Owning a beautiful lawn in a country side is something that most of us would take pride in. It’s one thing to appreciate and take pride in owning one while it had always been quite a thing to maintain one, untill the leading manufacturers of outdoor power tools came up with an useful machine that could reduce the labour and time required and yet could do the entire job of mowing a lawn with efficiency and precision. The zero turn mowers or ZTMs are standard riding lawn mowing machines with a rear wheel drive that have a true turn radius of zero degree i.e the lawn mower can turn an entire 360 degrees on a dime. These machines were essentially built for commercial purposes but are also available for residential uses now. These effective grass cutting mowers can be easily maneuvered round obstacles and they pivot so tightly at the end of a cut row that you would not be in the need of overlapping or cutting the grass in a cross-hatch pattern. Grasshopper Mowers were the first to introduce commercially viable ZTMs in 1969 but today there are around three dozen manufacturers and hundreds of different models of zero turn mowers that you can choose from. Before we dive into the details of the essential factors that have to be considered for investing in a zero turn mower, we need to know the different types or categories of ZTMs available in the market. The zero turn mowers actually fall under four categories. The Entry Level Mowers are perfect for those who would be engaging in lawn mowing once in a week or even less. Some lawn care experts recommend that lawn mowing should be done once in two weeks only so that a sustained healthy growth of the lawn is maintained. These mowers are made of stamped parts and steel spindle materials and can only withstand periodical use. Owing to the cheap manufacturing cost they are less expensive than the other categories but are not at all recommended for regular use. They traditionally have one or two cutting blades and is good enough for a small sized lawn. A Mid Grade Zero Turn Mower is perfect for a owner who possesses around an acre of lawn that has to be mowed once a week at least. 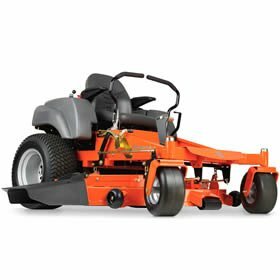 These mowers have a wider deck and hence provide you with a larger cutting face with a more powerful engine. So even though these mowers are not as fast as the ENTRY LEVEL ones they do their job pretty quickly owing to the amount of grass that is cut in a single pass. They are more comfortable than the entry level mowers and have some standard features like foot assisted deck height adjustments. They are a little more expensive than the entry level mowers and the price range starts from $3000. Owners of small landscaping business who cannot afford a commercial zero turn mower settle for the Semi Commercial variants. These are usually made of welded steel and are more durable than the entry level or mid grade ones. They have a deck size which is larger than that of the mid grade ones and a faster speed backed by a powerful engine. They have a decent sized fuel tank that can mow around 5 acres of land in one fill. They have more detailed features to their credit and can withstand daily use, can mow multiple lawns in a day in a decent time and come at half the price of the commercial ZTMs. The price range of these semi commercial ones start at $4000. The most expensive and the most powerful beasts, these commercial mowers can take up humongous tasks and complete them in record breaking time. They have the largest decks, the most powerful engines, the biggest fuel tanks and the fastest of speeds.They are capable of mowing anywhere around three to four acres of land in an hour and start at a price range of $10000. So by now you must have understood that you need to choose the mower according to the job in hand i.e the amount of mowing that has to be done each week, the speed at which it needs to be carried out and the amount of dough you are willing to spend. But before you actually go and invest in one, you need to know a few essential factors that differentiate one ZTM from the other so that you can make your choice wisely. The first thing that has to be kept in mind while deciding on a best zero turn mower is its engine. The maker of the engine, the type of engine and the power it can generate are the three essentials factors that you should look for in a ZTM engine. Most of the Zero Turn Mowers use a Briggs and Stratton Engine. Briggs and Stratton is an American Company with an experience of over a 100 years and has been trusted by millions across the globe. They will provide you with the latest and the most powerful and reliable engines in the market. Some other well known models use a Kohler Engine which is almost equally good when it comes to power and reliability. Engines with a foreign or a non-American make like Kawasaki are also very good but they may increase the cost of the machine while doing the same job as its American counterparts. Also an American engine will be easier to repair or replace in case you need it. So it’s always better to choose a model of ZTM that features a Briggs and Stratton or a Kohler Engine. Depending on the number of cylinders the engines can be categorized into single or V-twin cylinder engines. Single cylinder engine are cost effective but cannot provide the powerful torque required to pull off a rigorous mowing job. Only a few Entry level models feature a Single cylinder engine while most others use a double or a V-twin cylinder engine. The V-twin cylinder are more expensive than the single cylinder ones but are worth the dough due to their performance. They provide better torque, better gas mileage, lesser noise and vibration. They also tend to have longer lives. So if you have a very small sized lawn only then you can go for a single cylinder engine otherwise it’s always better to invest in a V-twin cylinder. The power of the engine is directly proportionate to the performance of the engine. An engine with a large horsepower will definitely deliver more compared to the one that has lesser power. But while choosing a ZTM and the minimum power that the engine should be able to generate you have to consider your lawn size, the thickness of the grass and the deck size before deciding on one. Medium or large sized lawns and thick grass needs more power in an engine to make its way through and do a decent job. A large deck with a not so powerful engine is not worth investing in. The advantage of the deck size can be fully utilised only when it’s powered by a well pronounced engine capable of handling such a wide deck. When the two are in accordance i.e. when the deck size is supported by a powerful engine then the ZTM will deliver a mow with efficiency and precision and will also reduce the amount of time required to do the job. ZTMs with high speeds but a low proficient engine cannot bring in precision at high speeds. The more the horsepower, the better is it able to perform at high speeds. Also lawns with hills or slopes require more powerful engines than the ones that are flat with obstacles. The second most important feature that has to be considered after the engine is the deck of the mower. The size of the deck and the material with which it is made completely changes the attributes of a zero turn mower. The deck size also referred to as the cutting width is an extremely important factor that has to be looked in to. A larger deck means that a larger amount of grass is cut in every pass. But that doesn’t mean that getting a large enough deck eases the job for you. If you have a large lawn then getting a large deck is worth investing in. But for lawns with narrow spaces you need to consider a cutting width that can be easily maneuvered through these spaces. As described earlier a large deck has to be powered by a high endurance engine. There are models that provide a large deck with a engine of low endurance to cut down the cost of the machine but these machine are not worth investing in.So choose a ZTM that has a deck size that is ideal for your lawn and a powerful enough engine to back its performance. The deck size or the cutting width ranges between 42” and 72”. Ideally a 42” deck is good enough for a 1 acre lawn. Not the company but the material with which the deck is made plays an important part in determining its performance and durability. Mower decks are either fabricated or stamped. The fabricated decks are made by welding heavy steel while the stamped decks are made by long moulds or presses of lighter gauge steel. Both the types have their share of advantages and you need to choose the one that best suits your needs. The fabricated decks are more durable and can withstand rugged conditions and long mowing sessions but are more expensive than the stamped ones.The fabricated decks are preferred by professionals.The stamped decks on the other hand are lighter, allow better air flow and are more suited for mulching and bagging. They are cheaper and are more likely to be found in entry level mowers. The drive system is determined by the transmission and is the third most important factor that has to be taken care of. Most ZTMs use a hydro-static hydro gear EZT transmission from the 2200, 2800 and 3100 series. They are time tested and have a reputation for their maneuverability, ease of use and durability. Each rear wheel has a transmission independent of the other and this attributes to the zero turning capability of the mower. The hydro gear EZT 2200 is ideal for entry level mowers. The integrated transaxle features a 10cc variable displacement seven pistol axial pump and a 10cc fixed displacement five piston motor.They are maintenance free sealed units that means that they do not require oil or filter changes. But at the same time it means that if this unit wears or breaks off you need to replace the entire unit. These units are well capable of carrying out the job on a relatively flat terrain and can be used to pull lightweight cart. For uneven terrains, slopes and for pulling heavier loads you need to step up the transmission. These units are more reliable than the EZT 2200 and will do well in residential environments. The integrated transaxle features a 10cc variable displacement seven piston pump and a 16cc fixed displacement seven piston motor. They are easier to maintain and have an external oil filter. If you have uneven terrains or slopes or want to haul over 250lbs then these are the ideal transmission systems. More preferable for commercial purposes these score over the ZT 2800 in that they have heavier parts, an overhead relieve valve for enhanced protection, a charge pump for speed and durability and a steel pinion to add strength to the machine. While working with your Zero turn mower it’s extremely important to get used to the throttle response and the sound of the machine. You need to exactly understand when you are overworking the transmission and change it accordingly, the throttle and the mowing speed. Overworking the transmission will lead to wearing and will decrease its life span. The speed with which a zero turn mower delivers is extremely important when it comes to the time in which you want your job to be done. But a zero turn mower with a high speed does not essentially mean that you can mow in a record time. The zero turn mower when coupled with a powerful engine and a wide deck can deliver precision at high speeds. If the speed is not backed by a powerful engine then the job cannot be well done at high speeds. Also the control of the machine is an important factor when it comes to working at high speeds. Turning on high speeds can result in unsightly gouge on the turfs. The speed of entry or mid level mowers is 4-6MPH while those of the semi professional ones are around 8-9MPH. The professional mowers can churn off maximum efficiency even at a speed of 13-14MPH. The rear wheel size and the ratio of the size of the rear and front wheels is responsible for the centre of gravity of the mower. Most ZTMs have a rear wheel size of 18” and a front wheel size of 11”. This keeps the mower grounded. Large wide rear wheels ease out the pressure on the grass turf and flatten them less. The large rear wheels also add to the maneuverabilty and are preferred for slopes and uneven terrains. So only if you have a flat terrain can you settle for something less. When you are looking forward to long mowing sessions, then comfort should be high on the priority list. Any discomfort would lead to fatigue and would make your mowing not an enjoyable experience. The comfort is determined by a number of things, viz. The seat, the ergonomics of the handles, the type of controls, the reachability of the controls and the view from the operator seat. The ZTM should have easy accessibility for the operator to mount on or off the mower. The handles or lap bars should be adjustable so that any sized rider can fit in. Most mower lapbars swing out to facilitate easy sitting of the rider. This swing out is often integrated with parking brakes. Once the rider is well seated there should be ample leg space for the rider to comfortably maneuver the machine. The seat should have a large comfortable back rest for maximum comfort. Most seats come with a back rest of 15” to 18” and have a full suspension for bump free rides. Mid level and higher ZTMs come with height adjustment facility so that you can adjust the height of your seat according to your convenience. Most ZTMs are controlled by lap bars. Foamed laps bar handles add to the comfort when you are working for long hours. The reachability and ergonomics of the control panel add to the ease of use and in turn adds on to your comfort. It’s also very important that you can view the ground in front of you clearly and your vision is not obstructed by a strategically placed oversized deck. As far as the controls are concerned the most common controls are the lap bars. They are easy to use and a neutral position lodges the brake. Controlling the lapbars for forward reverse or turns needs a little practise and can be expertised with time. Some of us are more comfortable with steering controls that mimic a car and there are models that use the traditional steering for controls. There is a gas pedal for forward and backward movement and a brake for stopping. These are ideal for slopes. Some more advanced models use Joystick. They are expensive and use digital control on the wheel movements and are featured in more commercial models. Some models even have arm rests and a cup holder to add to your comfort. The turn radius of the ZTM is extremely important. While investing in a zero turn mower you need to look for a certified ZTM. Only a certified zero turn mower can rotate to 180 degrees over a dime. A nearly zero turn mower will not have a zero turn radius and will leave uncut patches and you will find it difficult to maneuver such mowers around obstacles. They will never have the precision of a zero turn mower. The fuel tank capacity required for your ZTM depends essentially on the amount of lawn you need to mow and also the type of terrain. You would not want you Zero turn mower to run out of fuel even before you have completed doing the job. Most ZTMs come with a decent sized fuel tank. The capacity of the tank depends on the type of ZTM you are going for. Once you are done with mowing its extremely important to clean your mower deck and blades. This is required to maintain the sharpness and the durability of your deck. Most Zero turn mowers come with a hose pipe attachment where you can connect your hose pipe comfortably and carry on the cleaning process easily. Though this may sound to be a very minor factor when deciding on a model, but these simple additions add on to your model. The ease with which you can reach the deck and the hose pipe attachment makes cleaning and maintenance easier. While choosing your ZTM you have to be extremely careful about the size of the machine and the deck size. Choose one that can be easily stored and moved from your garage to the lawn. A wider deck compared to the storage space can result in storing problems and would not be wise to invest in. You may think how on Earth the weight of the machine should be of any concern. But as a matter of fact if you are looking for a machine to do landscaping work only, then it should not be a heavy weight one. Heavy mowers are not easy to transport and you should be least sure that your mower is not heavy for your lift jack or lift machine. If you cannot lift the machine with these tools you wouldn’t be able to get underneath it to sharpen the blades. The cost of the Zero Turn Mower depends on a number of factors viz. The type of mower, the type and power of the engine, the size of the deck, the material with which the deck is made, the speed of the machine, the kind of transmission it has, the maneuverability of the machine, the additional features that it has in terms of comfort and performance. You need to choose the model that would best suit your needs. Do not invest unnecessarily on a fancy feature while taking care that you are also not cutting on the cost by compromising on the performance of the machine. The after sales service, the availability of parts and the warranty are not something that can be ignored while investing in a zero turn mower. These machines are expensive and you would not purchase one too often. So you need to be extra cautious that the company has a good and reliable after sales service. Also read the terms and conditions and type of warranty carefully. You should ideally purchase a machine that would give you a minimum of three years of on-site warranty on the product. Some companies even offer a lifetime limited warranty on the frame. Though these are the most important factors that have to be taken into consideration while going for a best zero turn mower in 2019, but there are a host number of other factors as well that may influence your decision, like the ROPS (roll over protection structure), the easy access to accessories, type of discharge etc but they are definitely not as important as the ones mentioned above. So we hope that with this detailed knowledge of the zero turn mowers and a thorough knowledge of the lawn that you would be dealing with choosing a perfect Zero Turn Mower 2019 wouldn’t pose much of a difficulty for you.